The Best Choice Products Folding Adjustable Magnetic Upright Exercise Bike is an affordable priced bike to get low impact cardio exercise in your home to help. It is compact when in use and folds up for storage making it great for all homes – small or large and apartments too. It is no frills, like all bikes in this price range but it does have one feature that is over and above most other bikes. It gives you the ability to exercise in three positions – from upright through to semi-recumbent so you can get the most comfortable position for you. In this review I look at how well the bike actually meets the demands of an exercise bike in the home to see if the affordable price is really worth it and you’re not just ending up with an expensive clothes hanger! The bike frame is made from steel which, despite its appearance and being lightweight (40.35 lbs), it holds steady providing it is on a level surface. It allows you to get on with your exercise without being concerned about being tipped off. There are no concerning creaks or squeaks coming from it (it’s quiet) as you ride it. The bike doesn’t have a levelers to balance the bike out on floors that are uneven. If your floor is slightly uneven the bike will rock. A rubber exercise mat can help to stabilize the bike if this difference isn’t too much. The bike seems to be sturdy and durable from customer experience so far. It hasn’t been available that long at present but initial reports are good, so there is no feedback from long term use. The bikes can be adjusted to fit a range of heights and also provide 3 different riding positions. This allows the bike to be used by multiple users. Making these adjustments is quick and easy to do. The height adjustment is for the seat only and involves loosening the adjustment knob on the seat post and sliding the seat to the height you want and inserting the push pin in the pre-set hole and tightening up in place. The seat only moves up/down which is on an angle that helps provide more room for taller people by moving them away from the handlebars when being used in the upright position. The bike would appear to adjust to fit people between the heights 5ft 3 ins and 6 ft from customer feedback (I’ve asked the supplier for confirmation). Below 5ft 3 ins you may find you are stretching to reach the pedals at the far end of the stroke depending on leg length. Over 6ft tall you are likely to be cramped and not able to get proper extension of your leg and not getting full range of motion of your knee. The three different exercise positions is done using the support post beneath the seat post that you can move to 3 different positions – it works in a similar way to the seat adjustment but instead allows the bike to move from a more upright bike position to a more semi-recumbent positions with your feet more out in front of you. This is good feature to give you a more comfortable position for you and the semi-recumbent can take some pressure off your joints. It also allows you to lean more against the backrest to support your back. The manual doesn’t give you instructions on how to do this but it is easy to do. The most recumbent position does have the seat tipping back just past horizontal being supported in the position with the back rest taking some of the support function from the seat – giving some relief to the sit bones and supporting the back. The bike has 8 levels of resistance. It’s controlled by the tension knob at the front of the bike just halfway up the frame – to keep it in reach for the 3 different exercising positions. It moves magnets closer to a flywheel (inside the casing) to make pedaling harder and further way to make it easier. The magnets don’t touch the flywheel so there is no wear and tear so there is no need to replace. It is also silent unlike bikes that use friction resistance. Turning the tension knob clockwise increases resistance and counter-clockwise decreases it. It turns easily and the resistance changes smoothly. It increases in increments so there are no sudden changes in hardness. At levels 7 to 8 you may start to experience some choppiness in the pedaling with it slowing up as you move around the top/bottom of the stroke. At levels 1 – 2 you won’t feel much pressure at all from the resistance. There are people who are using the bike to help with rehabbing their knees after injury and surgery (as advised by their doctor). It has a belt drive which is very quiet and doesn’t require maintenance. It is all enclosed to protect it and also keeps it away from little fingers, pets and your ankles and clothes. The pedals are positioned in front of you even at the most upright position which is the position in the picture. The bike design and pedals are designed for standing on like you would do on a spin bike. It is made for sitting and pedaling. You can get a comfortable pedaling motion with full range of motion i nthe most upright position. It may seem a little awkward at first if you are used to riding a bike. The other positions you are more laid back in a semi-recumbent position which you will feel the pedaling more at the top of the back of your legs. Seat. It is described by users as a comfy padded seat. It is large and comes with a backrest which supports the back in all the different riding positions. The backrest is at a slight angle which most people like and the angle can’t be changed nor it position in relation to the seat. Not everyone is going to like the seat when they first sit on it. It may take a little time to break it in especially if you’re not used to sitting on a bike seat. Some people will just find it hard on the sit bones due to this being such a personal thing. If you are one of those you can try a gel seat cover or padded bike shorts to add some more padding. If that doesn’t work it is possible to change the seat – you can take it to a bike shop you can buy a Universal Exercise Bike Seat Adapter and that allows you to add a standard bike fitting seat to it – you then have a wide selection to choose from. Noise. It is a quiet bike so you can exercise and watch TV at the same time. It won’t disturb others and you can use it at night. If you live in apartment your neighbors won’t get bothered by you using it. If you are concerned about people living below you then a rubber exercisr mat should be enough to prevent any possible vibrations transmitting through the floor. Dust and Dirt. There’s not much to worry about here – it’s not going to generate a lot of cleaning work for you. The biggest issue is likely to be sweat – you need to wipe it off the bike to keep it looking good and performing well. It may also drip on the floor and a rubber exercise mat will help keep it free of sweat. Handlebars. The bike comes with 2 sets of handlebars – one at the front of the bike and the others at the side of the seat. Both sets are covered for a better grip to avoid slipping and blisters. The front set of handlebars include pulse sensor that work with the console to monitor your heart rate. The ones at the front are for using the bike in the upright positions and the ones at the side of the seat are for the 2 semi-recumbent positions to give you some support if needed. It does fold up to a compact size, although exact dimensions aren’t available, it should fit in a closet or behind a door out of the way. It won’t fit under a standard size bed. To fold up the bike you remove the holding pin and slide the stabilizer bars together – it closes up together like a pair of scissors or an ironing board. You re-insert the pin to hold it in place and you can then move it and store it. The bike comes part assembled. It is fairly straightforward to put together, despite some very poor assembly instructions. It should take between an hour to 2 hours but some finish quicker – it just depends how well the instructions can be interpreted (or ignored). It does help that much of the hardware is located in the holes they are to be fixed in. To complete the assembly you add the pedals, seat post, support, seat, handlebars, console and stabilizer bars. Apart from the poor instructions the most difficult part is adding the stabilizer bars – that is due to having to hold the bike in place while you bolt it on to the bars – you might want a 2nd person to hold it while you do this as precaution against possible mishaps. The console is basic. It measures time elapsed, speed, distance, calories, odometer and pulse when the heart rate sensors in the front handlebars are gripped. The LCD screen displays one measure at a time or you can set it to scan through the measures every few seconds. The selection is made by pushing the mode button beneath the screen. The measures can be seen clearly as you exercise except in poor light as the screen is not backlit. From the manual it measures speed in km/h and distance in kilometers. Having said that the measures are estimates only and shouldn’t be taken as accurate, they are there as a guide only. To clear the measures you press the reset button. It turns on/off automatically – when you start pedaling or press a button it turns on and turns off when the bike hasn’t been used for 4 minutes. It takes 2 AA batteries and are replaced by removing the battery cover at the back of the console. It doesn’t store or upload your workouts for you to track progress – this is going to be need to be done manually if you want to track your progress. Nor does it have any pre-set workouts to follow along to help you get started. It doesn’t come with any accessories. If you want to have water close by you can rest a water bottle on the frame between the uprights where it crosses over. Or you can exercise near a table and put your water bottle holder as well as anything else you might want near such as a TV remote or phone. There is little help in the instructions on setting the bike up correctly for your height or the 3 riding positions nor is there any suggested workouts to follow along to. There are only about 20 reviews online at present. They are on the whole positive. most find it a good folding exercise bike for the price, There are a couple of exceptions to this where people have received a bike that wasn’t up to scratch but they do appear to be the exceptions. By far the majority of reviews say how they like the bike and the workouts they can get. They’re low impact, quiet and allow them burn calories and improve their fitness. This is an affordably priced bike especially with the ability to use in three different positions to get the most comfortable riding position for you. As you’d expect at this price it is no frills and is made for light to moderate exercise which it seems to provide this to the satisfaction of customers. At Amazon the bike qualified and free shipping when I checked. Best Choice Products Folding Adjustable Magnetic Upright Exercise Bike is a simple and convenient bike to use. It’s compact size and its quietness means it can be used just about anywhere and at anytime. You can then exercise when you want. It won’t disturb others. It can be adjusted to fit people of a range of heights. The 3 exercise positions means you can also get to exercise in the most comfortable position for you. 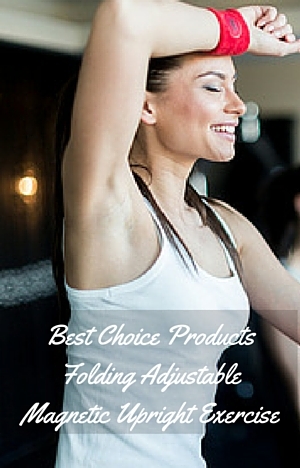 It seems to be durable and sturdy so you can just get on with your workout. It is for beginners and those wanting low to moderate levels of intensity. It’s not for people who want intense training or spinning type workouts. The bike appears to provide good value for money and can help you get into shape, stay in shape and burn calories when you want which all helps to make it something you’ll actually use (and maybe even enjoy using! ).